The much-anticipated launch of Fenty Beauty earlier this month has still left people awestruck weeks later. From a 40 shade foundation range to showstopping highlighters and super-creamy contour sticks, we can’t recall a debut collection as diverse and justifiably hyped as this one. You can imagine every beauty buffs amazement then when Rihanna revealed that the brand is about to launch it’s first ever holiday collection in just two weeks time. Available from 13 October, the exact details of the launch are still well under wraps but judging from the social media images the singer-come-make-up maven has posted, it’s going to be seriously out of this world. So, what can we expect to see? Firstly, lipstick lovers who were left baffled after the initial range included just one “universal” lip gloss shade will be pleased to hear that the Galaxy Collection is to include four Cosmic Gloss lip glosses and four Lip Glitter lipsticks all packaged in the brand’s now signature hexagon shape. From what we can see, it looks like there’s a coral, pink, lavender and autumnal berry red. 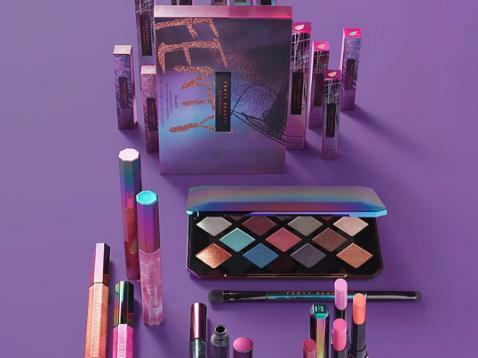 It also looks as though the collection is going to include liquid eyeliners and a mesmerising 14 shade eyeshadow palette that’s made up of vibrant metallic shades of gold, silver and pewter as well as bright pink, purple, blue and green. Fancy a sneak peek? Luckily, Rihanna posted an image of herself wearing the shades Nepturnt, Sublime and Xtraterrestrial on her lids in a recent Insta post. A far cry from the neutral tones and powder pink packaging of the original launch, this new holiday collection also comes housed in jewel-toned rainbow iridescent packaging. If you’re keen to get your hands on the new products then mark October 13 in your calendar and while US based fans should expect to make a beeline for Sephora, the range will be available exclusively at Harvey Nichols in the UK.